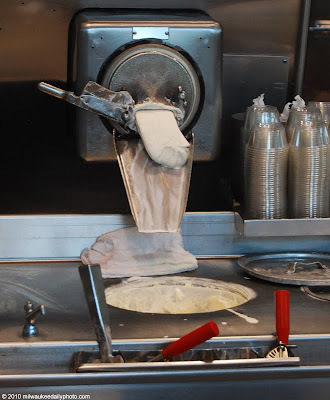 Ice Cream is good, but in Milwaukee, we love our Frozen Custard. In today's photo, fresh custard flows from the freezer into a catch container at Kopp's location in Greenfield. In addition to the standards, they feature daily special flavors. Today is one of my favorite days of the year, as Kopp's makes Palermo Lemon. Only available a few times a year, it is a treat I look forward to. Oh, yes! Kopps! There is none better. My fave is the Caramel Cashew.